TCR-HF is a low-loss NiCr thin-film embedded resistor copper foil designed for high-frequency applications. Versatility: TCR-HF is optimized to achieve maximum performance when used with PTFE resin systems. Greater Uniformity: Thickness of the resistive layer is precisely controlled utilizing a proven vacuum metallization process, which ensures uniform ratios of the elements in the deposited alloy and results in minimal resistance variation. The resistance is isotropic and is not dependent on the machine or grained direction of the copper foil or resistive layer. Product Performance & Predictability: Low thermal coefficient of resistivity minimizes change in TCR-HR foil resistance during lamination. Predictability and consistency lot-to-lot and sheet-to-sheet are ensured through extensive testing under varied lamination conditions. 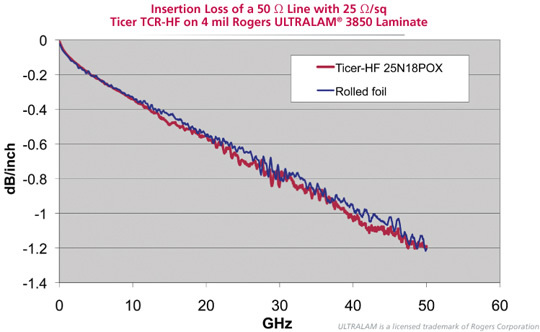 Better Resistor Tolerances: Final etch tolerances benefit from TCR-HF’s thin and uniform resistive layer. TCR-HR can eliminate laser trim requirements in all but the most precisely toleranced resistors. Reduced Fabrication Steps: When coupled with nickel chromium (NiCr), TCR-HF can reduce fabrication steps by eliminating the need for a separate resistive layer etch. TCR-HF can be etched first in cupric chloride, followed by ammoniacal etchant. An alternative etch for NiCr is acidic permanganate. Excellent Thermal Stability: NiCr is noted for its excellent thermal stability under continuous load and thermal excursion. It can be subjected to multiple thermal excursions, such as lead-free reflow, with minimal resistance change and ensured long-term reliability. The thermal stability of TCR-HF makes it an ideal choice for designers and users with exacting thermal stability requirements. For more information, download the TCR-HF brochure. TCR-HF is available in a variety of foil widths using 0.5 oz Grade 3 copper foil. For more information, download the product specifications.